This week’s downloadable design resource for Access All Areas has been kindly donated from Angie Makes. It’s a collection of 16 floral watercolour patterns that have been carefully hand painted and processed into seamless repeating pattern swatches. At 5000px+ in size and 300ppi resolution they’re extremely versatile resources that can be used for printed and digital designs. 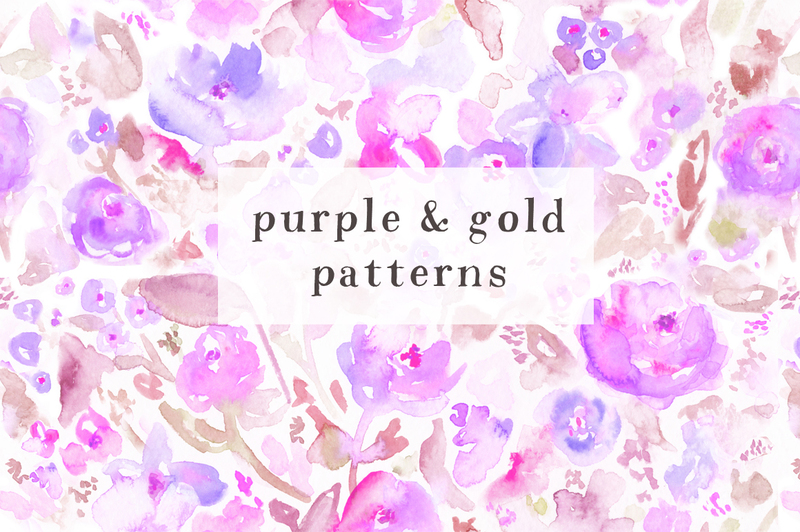 This pack of purple & gold floral watercolor patterns from Angie Makes is the latest resource for Access All Areas members to download. It contains 16 patterns that all seamlessly repeat to cover an infinite area. All the graphics come as JPG files, so they’re perfectly compatible with any design program, which is good news for those who don’t work with Photoshop! That’s great to hear Kith, I hope they come in handy! Credit has to go to Angie for making these beautiful graphics, but thanks for the super kind words! One of the impressive and interesting information about color who just make a creative design and more attractful layout, thanks for sharing and great effort. Beautiful designs! I was just wondering if these would be covered under an extended license – so if I’d wanted to, I could use it in things I would sell online? These designs are so pretty! I like gold! Thank you, Angie! And, thank you, Chris, for bringing us such awesome goodies!